Bloodbath in the Markets.. Should we Worry?? Social Travel - The next big Investment Opportunity? Hope you are all enjoying the upswing in the market. Nifty has bounced back and bounced back in a really awesome way. I wrote an article long back when the overall market was bearish and those who shopped for quality stocks at that time are sitting on huge profits. New Readers can read all prior articles by clicking here. Recently, I was part of a discussion where there was a heated argument between two sets of friends. The discussion was on which approach is much better and advantageous for stock picking. One set was purely a fundamental group and the other was a technical group. If you are wondering what this really means, don't worry. We will clear this confusion in this article. I have heard a lot of people calling Technical analysts as Gamblers and Betters. There is a great respect for Fundamental analysts. Many people stay away from market after losing huge sums to hot tips from Technical Calls. As you all very well know, I pick stocks purely based on fundamentals and hence I am a FA. However, I am very lucky to be in touch with some amazing Technical analysts (TAs) who make amazing returns in the market mainly with their discipline, emotion control and speed. Let us first understand the two words - Fundamentals and Technicals. I have listed a few above. Now, FAs look at the criteria above and more before picking a business to invest in. When the business is meeting most of the strong fundamental requirements, it becomes attractive to fundamental buyers. Since market ups and downs are not in our control, FAs sometimes wait for years and years and make handsome returns. They mostly never lose money since they are invested purely and purely based on the fundamental strength of the company. They strongly believe in betting on fundamentals of a company hoping that some day, market will pay for the growth and potential of the company. Also, compounding always works on long term. So to summarize the investment approach for FAs - Compound money, no matter how much time it takes. We need to remember that the value of any business is after all, how much a buyer would pay for the business. It is never on how much the seller quotes in a dynamic market such as ours. Let me explain above statement. Based on my fundamental analysis of various parameters, I concluded that a stock is worth Rs 100 per share. Let's say it is quoting at Rs 60 per share. I buy truck load of it. Now, is this is a good buy? At first look, of course it is a great buy and a steal. However, unless more and more investors find value at 60 per share, the price will never move up. Sometimes, the stock would stay at Rs 60 - 80 per share for 4-5 years and then suddenly go up 3 or 4 times. Hence, in market, it is important that more and more investors buy the stock and hence it moves up. Buying or selling interest is a key element to stock price movement. Unless demand picks up stock will not rise and unless supply picks up stock will not fall. Keeping this in mind, let us move to Technicals. For TAs, Timing is Everything. I have lots of TA friends. TAs work on charts of stocks. Let's try to understand why TAs look at charts of any listed business. What is there in a chart after all, you might wonder. In stock market, Information is everything. Traders or investors who get any news first make the most of any stock movement. The retailers like us generally get news last on TV channels and we enter at the fag end of the movement. Great results, a big money deal in a business, a loss making unit being sold off, some big order wins, release of pledge etc. are some of the information which will make a stock run up. Rising prices of raw materials, shares getting pledged without justification, union problems in companies, forgery in balance sheets, government interventions which impacts certain businesses negatively etc. will make a stock run down quickly. The thumb rule is, if you notice the charts carefully, a stock price begins to react even before the news is actually out. Whether it is positive or negative news, stock price movement begins before the actual event happens. So, a TA, analyses a chart of a stock and tries to find out if some action is happening. A TA ideally need not have any idea of the fundamentals of the business. Decisions are purely based on chart movements. When the chart shows that there is heavy accumulation with volume, or a major breakout of a resistance, the TAs buy heavily without even looking at whether the stock is fundamentally strong or not. If the chart shows heavy selling or breaks some major support points, they sell the stock like there is no tomorrow. Technical analysis is a vast field by itself and takes a lifetime to perfect. I have huge respect for disciplined technical analysts. If someone bought Force Motors at Rs 950 per share in 2006. He/She waited for 11 long years to make 4 Times money which is ₹3800 per share. Now from the above chart, have a look at that smart person who bought shares at Technical breakout at Crossover of ₹1000-1025 weekly basis in 2014. Force motor price hit ₹3800 in 2015. So it was a 4 Times gain in Just 1 year Time Frame approx. 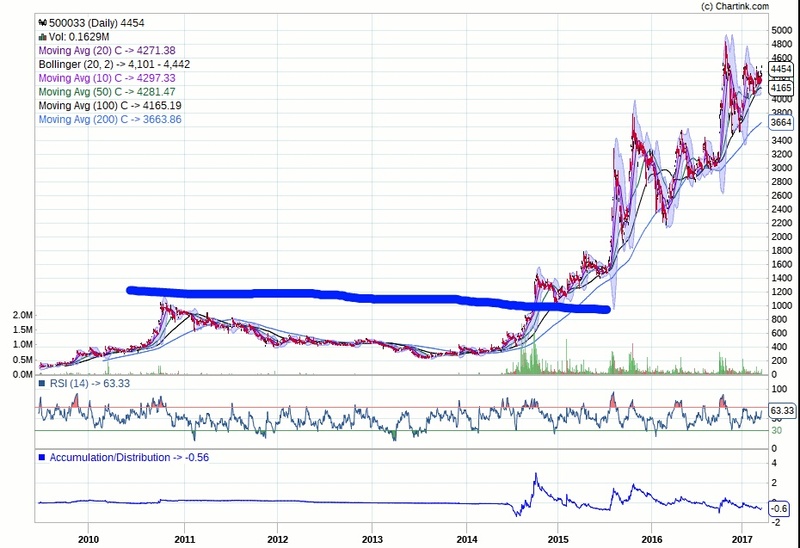 Force was moving in a broad range since Years but those volumes in 2014 were exceptional which was not witnessed prior to 15 Years History of Force Motors. Soon there was breakout at various levels & the Beast was unleashed. Consequently Force motor hit ₹4800 from ₹300 in just 3 Years and became a Multibagger. It is 16 Times Returns in 3 Years in comparison to person who made that same in 10-15 Years. - Exit is more hard and important in this market than Entry. - Technical analysis is a golden tool to decide Exit from a stock. - Price & Volume if used effectively, then one can make big money in Short Span of time. - Sometimes news burst later while market makers discount the event prior. - In that case technical analysis help us to know that major event, before it come in general public, with help of Price & Volume. 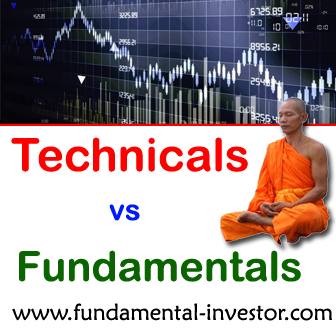 - Fundamentals tell us What to buy & Technicals tell us When to buy & most importantly when to Exit & encash gains. Another interesting article which I read on my dear friend Abhishek Ninaniya's website is a must read. However, TAs need not always be right. Hence, they always place their money with a Stop loss. You would never hear a FA talking about stop loss generally. Good TAs will book loss the moment their stop loss gets triggered or book profits the moment their targets are hit. They need to be extremely disciplined and need to closely watch their stock movements every single day. They will go through multiple emotions like excitement, stress, happiness, anger and also high blood pressure since they watch their stocks very closely. On the other hand, a FA only needs to ensure that every quarter, the business performs as per his/her expectations. If one quarter goes bad, a quick sync up with company secretary can give a guidance on whether any major change has happened as per fundamentals. If fundamentals have not changed, a FA will add more of the business at a lower price. So, friends. What's the best combination? Just being a good FA or TA might not be enough in the market. If we can strive to develop a good combination of both fundamentals and technicals, we can make mind blowing returns in the market. For eg: If a stock is fundamentally looking cheap, buying after a technical breakout etc. can give huge multibagger returns. Also, if we are holding on to a stock which is being sold with heavy volumes, it might help to recheck our fundamentals and help in taking a wise decision. On the other hand, a good TA, with help from fundamentals can really filter the companies well and take chances on better companies to make healthy returns with less stress. So friends. Let's respect both TAs and FAs. Let us develop the Art of Stock Picking and be open to various approaches to creating wealth in the Stock Market. Very nicely explained about differences of FA and TA. Highly appreciable work. Thanks a lot Sir. I too agree with Jayesh Prajapati . Excellent article. The best way is techofunda (combination of Funda + Technical break out). Happy to receive your thoughts Smita madam. Site best viewed on Google Chrome or Firefox. Copyright of FI @ 2016. Travel theme. Theme images by Petrovich9. Powered by Blogger.